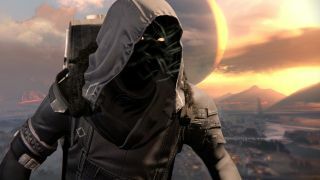 Destiny: Xur weapons, gear, and location, September 1 - 3: Plan C, Invective, and Trespasser! Xur stood in the Tower hangar, and Xur pondered. He couldn’t have truthfully said that he was distracted by the Guardian ships soaring in and out of the landing bay. Indeed, such a statement would imply that he ordinarily had any focus beyond his present function, and the past, of course was someone else’s tall tale to tell. But he couldn’t shake the incessant suggestion that he was aware of them. He did not wonder, like so many who build stories from the bricks and stones of others’ lives - why do they construct such walls around themselves? – where these ships may be going, or where they might have come from. Rather, it was the very persistence of the dance that perplexed him. The texture of their action, and the intent in their movement. A defiant graffiti of hope and assumed possession scratched shallow into the deep skies. Did they not know what was coming? Its path had been hewn into that air for as long as that air had been in place. And yet still they danced. Perhaps he could silence them with a warning. More likely he would incite them further. These people were rarely so rational as rationalising. Post-script authors of their own lives, able only to act when the time had passed. They would have to wait. It would have to happen, as it always did. Of this he knew. Until then, only the function. What’s good? The Peregrine Greaves, alas, are a bit shabby, simply increasing the frequency of Heavy ammo pick-ups, and the amount you’ll find in each one. Consider that better combinations of Heavy ammo buffs are available on other Titan Exotics – say, the Taikonaut, which beefs up the drops and gives you a bunch of upgrades to your rocket launchers – and you’ll likely wonder what the point is. The Shinobu’s Vow gauntlets are a good bet for Blade Dancers – just as good, in fact, as when they were on sale last week – bestowing an extra Skip Grenade for every charge, and buffing both grenades with extra power and a bonus tracker. Probably handier in the Crucible than in PvP, but pretty strong in either scenario. The Warlocks’ Purifier Robes though? Pretty weak. They simply disorientate nearby enemies when you pop your Radiance to self-revive, giving you a slightly easier route back in to the fight – albeit usually unnecessarily so - but presenting, on the whole, rather a waste of an Exotic slot. Heart of the Praxic Fire, people. If you’re looking for a Sunsinger Exotic – particularly one built around Radiance - go for Heart of the Praxis Fire. I’ve been telling you this for three years. As for guns? Much better, thankfully. Plan C is still a really solid choice for Vanguard or Crucible, with good range, impact, and stability, and a nonsensically fast recharge rate after a weapon-switch. A potent back-up weapon indeed. Trespasser (also just as good as it was last week) is a beast of a side-arm, fast, hard-hitting, quick to reload, and possessing buffed damage after a reload. Which will happen a lot because, as I just said, it both empties and refills its mags very quickly. And Invective? Oh dear lord, in how many ways do I love Invective? There’s the way that it can hit things from a long way away, and really, really hurt them. There’s the way that it can be modded out so as to be really stable while doing so. There’s the way that it will carry out the above action three times in a row, and very quickly indeed, if you simply hold down the trigger. And the way that the last of those three shots will do extra damage, entirely confirming, in case there was any doubt, that yes, Invective is the most ferocious, efficient, and all-round goddamn perky, short-range death-hose there is. There’s also the way that it will regenerate ammo. And it looks stupidly cool, and sounds like an angry, barking, robot wolf-dragon every time you fire it. I love Invective with all of my being, and always will. As ever, Xur will be around until 10am UK / 2am PT on Sunday, at which point he’ll be away. He may return. Or he may not. Or he may return as something else, though of course, it’s debatable whether such an event could truly be determined a return at all, or simply a sanitised death. Xur ponders these matters as well, as he stands in the Tower hangar, such as this space is currently defined. A millennium ago it may have been empty firmament, drifting high above the minds of men – and oh what an existence that would have been. Today it is concrete, steel, and dense, fleshy yammering. Tomorrow it might be fire and fear, and naive outrage over the loss of a thing never truly owned. The day after that it might never have been at all. All of these things Xur knew, as he stood in this space. All of these thoughts occupied the same spot currently defined as his head, though of course he could not know, any more than he ever did, if they were truly his thoughts, those of his masters, or simply the present conduit of their ultimate will. Just as he knew that this question also, might not be his to ask. But regardless, the fire was coming to become this space, was here, and had ever been. They would be aware of it soon, and their function would change. His might also, but that was a matter to be decided on another day, and not by him.